Incumbent center-right president Juan Manuel Santos emerged triumphant from yesterday’s second round of presidential balloting in Colombia – giving momentum to his peace talks with the FARC and his efforts to continue improving the country’s democracy. He defeated challenger Oscar Iván Zuluaga, of the rightwing Union of the Democratic Center, which is led by former President Álvaro Uribe, a polarizing figure remembered in Washington as George W. Bush’s favorite Latin American leader. Santos prevailed by a clear margin of five percentage points, and Colombia’s technically impeccable vote-counting process virtually ensures that the outcome will not be disputed. The turnout of 2.4 million additional voters yesterday reduced voter abstention from 60 percent in the first round to a still-worrisome 52 percent. Regional divisions among the electorate were striking: in some areas long plagued by Colombia’s civil conflict, the President won overwhelmingly, and he achieved substantial gains in Bogota, winning a strong majority, thanks in large measure to the endorsement of leading leftist politicians. By contrast, in the central and southern parts of the country, particularly in Antioquia, the bastion of Uribismo, the opposition candidate garnered nearly two thirds of the vote. The candidates’ campaigns focused on the polarizing issue of peace talks with the Revolutionary Armed Forces of Colombia (FARC), which Santos launched early in his administration and have proceeded slowly but steadily in Havana. The President sought a second term in order to complete the negotiations and end a conflict that some estimate has taken more than 200,000 lives and caused devastating human and material damage over the past half century. By contrast, Zuluaga, taking his cue from his mentor and chief advocate Uribe – who had spent Santos’ first term and virtually all of the campaign vilifying the President as a traitor for having launched the talks – changed approach in the second round and suggested that he, too, sought peace but would impose far more stringent preconditions before talks. Most commentators viewed his shift as suggesting a return to the Uribe-era policy of crushing the insurgency before speaking with it. Ironically, polls showed an electorate that was barely interested in the talks and far more concerned with other issues as elsewhere in Latin America: citizen security, unemployment and public services (such as health, education and transportation) were at the forefront of voters’ concerns. On these fronts the two candidates offered little to distinguish themselves from one another. Further assessments of the voting data will indicate whether this may account for low voter participation in an election that outsiders perceived as momentous. While commentary in Washington and abroad has focused on the implications of the election for the peace process, the longer term consequences may lie elsewhere, particularly in the robustness of Colombia’s democratic institutions. We will never know the extent to which Zuluaga would have been a pawn of Uribe, but suspicions were widespread that he was to the former President as Dmitry Medvedev was to Vladimir Putin. Thus, beyond potential reversal of the negotiations for peace, a Zuluaga presidency might have entailed a return to authoritarian practices that had undermined Colombia’s democracy under Uribe and that Santos did much to rectify. 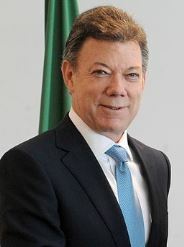 Although he is a staunchly establishment figure, Santos has advanced the spirit and letter of the 1991 Constitution, a progressive charter that emphasized separation of powers, rule of law, a strong and accountable judiciary, as well as minority representation and unwavering respect for human rights and accountability for abuses. Santos also embodied a spirit of reasoned deliberation both at home and in matters abroad. His pragmatic dealings with the often troublesome regime in neighboring Venezuela have been a far cry from the saber rattling that the rightwing authoritarian populist Uribe directed toward his similarly bombastic leftwing authoritarian counterpart Hugo Chávez. 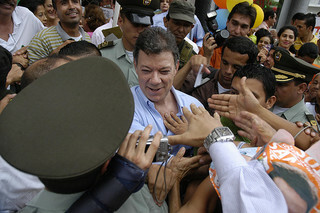 Four more years of Santos may or may not produce tangible advances on the issues that seem to preoccupy the Colombian electorate – jobs, public safety and services – but they probably will ensure continued strengthening of democratic institutions and continued opportunities for Colombia to join with sensible governments elsewhere in the region to cooperate productively regarding Venezuela and other regional concerns. It may also pave the way towards a lasting peace and some degree of reconciliation for a country long plagued by civil war.